This will bring you to a Google page. Type your username@lcmail.lcsc.edu and your password to sign in. Please see websites below to understand the disease and how to protect yourself and our campus. MMR vaccinations for measles can be attained through your doctor’s office, local Public Health Department and LCSC Student Health Services. Questions can be directed to Student Health Services at (208) 792-2251. Click here for more information about signing into your LCMail account. Lewis-Clark State College is committed to assisting all members of the LCSC community in providing for their own safety and security. The combined annual Clery Report and Fire Safety Report is available at http://www.lcsc.edu/security/crime-awareness. The report contains information regarding campus security and personal safety including topics such as: crime prevention, fire safety, crime reporting policies, disciplinary procedures and other matters of importance related to security and safety on campus. The report also contains information about crime statistics for the three previous calendar years concerning reported crimes that occurred on campus; in certain off-campus buildings or property owned or controlled by LCSC; and on public property within, or immediately adjacent to and accessible from the campus. 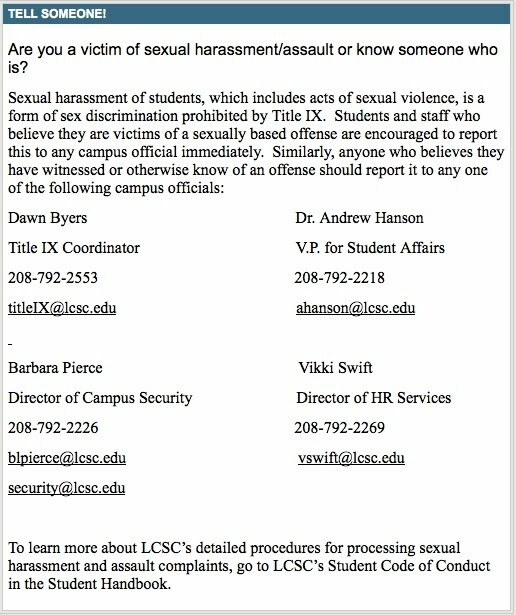 This information is required by law and is provided by the Lewis-Clark State College Security Department.